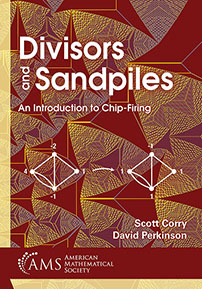 Divisors and Sandpiles provides an introduction to the combinatorial theory of chip-firing on finite graphs. Part 1 motivates the study of the discrete Laplacian by introducing the dollar game. The resulting theory of divisors on graphs runs in close parallel to the geometric theory of divisors on Riemann surfaces, and Part 1 culminates in a full exposition of the graph-theoretic Riemann-Roch theorem due to M. Baker and S. Norine. The text leverages the reader's understanding of the discrete story to provide a brief overview of the classical theory of Riemann surfaces. Part 2 focuses on sandpiles, which are toy models of physical systems with dynamics controlled by the discrete Laplacian of the underlying graph. The text provides a careful introduction to the sandpile group and the abelian sandpile model, leading ultimately to L. Levine's threshold density theorem for the fixed-energy sandpile Markov chain. In a precise sense, the theory of sandpiles is dual to the theory of divisors, and there are many beautiful connections between the first two parts of the book. Part 3 addresses various topics connecting the theory of chip-firing to other areas of mathematics, including the matrix-tree theorem, harmonic morphisms, parking functions, \(M\)-matrices, matroids, the Tutte polynomial, and simplicial homology. The text is suitable for advanced undergraduates and beginning graduate students. Undergraduate and graduate students and researchers interested in games on graphs, Riemann surfaces, finite abelian groups, and Markov chains.